A shorter, easier off-road ride to give you a chance to try it out or re-introduce yourself gently, before it gets darker and wetter. The tracks we will use are all ones that you can take at your own speed. If you wish, I and the other experienced off-roaders can give you some tips on how to handle the various ruts and ups and downs. Ride will be 8 to 12 miles, mostly off-road. 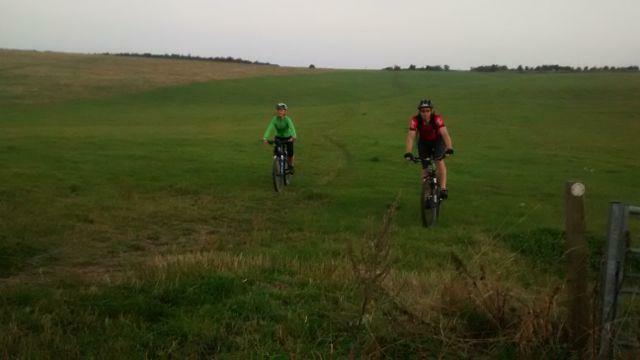 We'll start along Crab Hill to 'The Nelson' in Wantage. Then along to West Lockinge and up the gently sloped hill along Goddard's Brook. Here we will keep climbing as long as we all want to, also providing a good chance to observe the track for the way down. We'll return the same way, but may follow the road and cycle path instead of Crab Hill. This ride should suit any mountain bike, or, as long as the weather is not too bad, a tourer, cyclocross or hybrid bike with some knobbles on the tyres. 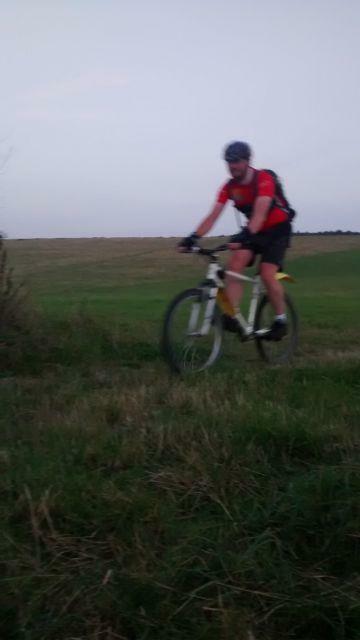 We'll aim to complete the off-road sections before it gets dark, but please bring basic lights for the journey home. A dry spell provided perfect conditions for the first of our two off-road 'tasters', and that no doubt encouraged 10 of us to assemble for it. Up the hill and the section into Charlton provided an interesting challenge in a narrow cambered track. Fortunately, Richard P went been down there last week with secateurs, so the brambles were not a problem. We went past the Nelson and along the cycle path to Lockinge, the up the long and gentle climb alongside Goddard's Brook. It was a beautiful evening and we could see for miles. 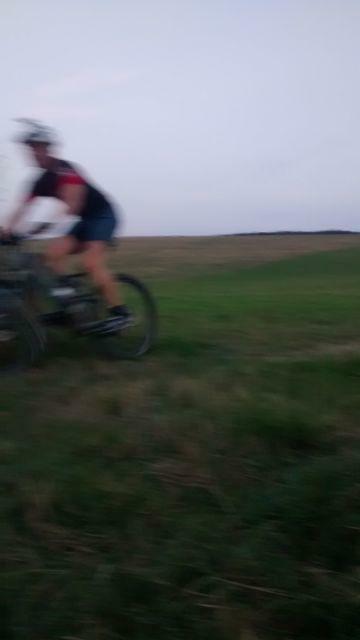 With the sun heading down as we headed up we continued on to the steeper, narrower section. At this point we split the group and half went ahead to climb all the way up to the Ridgeway. 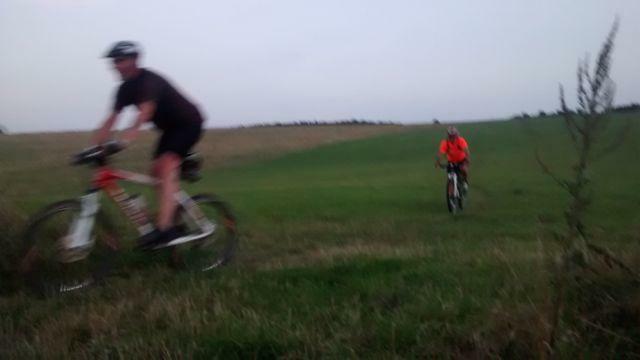 The rest of the group continued to the bottom of Middlehill Down. After a few minutes, we saw the other riders hurtle down the hillside in ones and twos, giving a real sense of the speed that you can pick up on a mountain bike. Then it was everyone's turn to descend. We headed back down the chalky track. The light was dimming, but still plenty to see by, and it almost everyone had a strong light in any case. Going down was a good chance to test out looking ahead and cornering without having to pedal. From the bottom of the hill, we returned to Grove via Harcourt Road and the cycle paths. It was just about dark by the time we arrived.